The following scenarios outline several of the primary usages of Key Vault’s certificate management service including the additional steps required for creating your first certificate in your key vault. Certificates are composed of three interrelated resources linked together as a Key Vault certificate; certificate metadata, a key, and a secret. Before a certificate can be created in a Key Vault (KV), prerequisite steps 1 and 2 must be successfully accomplished and a key vault must exist for this user / organization. On-boarding as the IT Admin, PKI Admin or anyone managing accounts with CAs, for a given company (ex. Contoso) is a prerequisite to using Key Vault certificates. DigiCert - Key Vault offers OV SSL certificates with DigiCert. WoSign - Key Vault offers OV SSL or EV SSL certificates with WoSign based on setting configured by customer in their WoSign account on the WoSign portal. 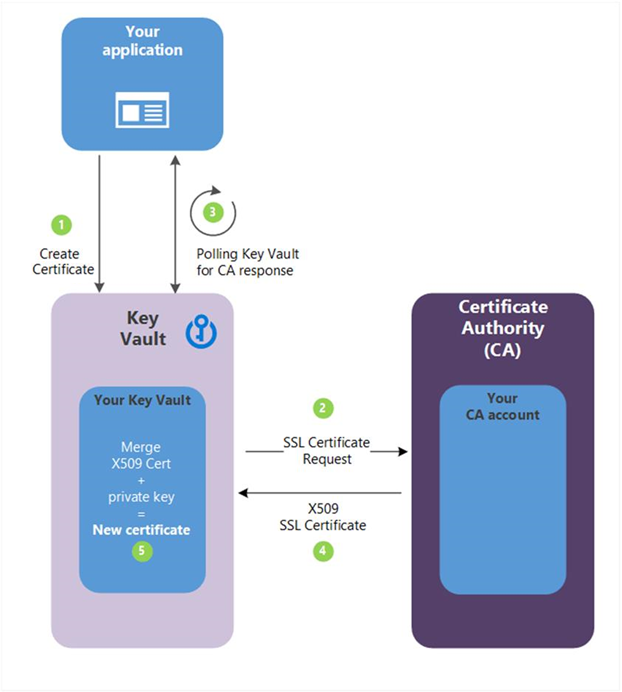 Step 2 - An account admin for a CA provider creates credentials to be used by Key Vault to enroll, renew, and use SSL certificates via Key Vault. Step 3 - A Contoso admin, along with a Contoso employee (Key Vault user) who owns certificates, depending on the CA, can get a certificate from the admin or directly from the account with the CA. Begin an add credential operation to a key vault by setting a certificate issuer resource. 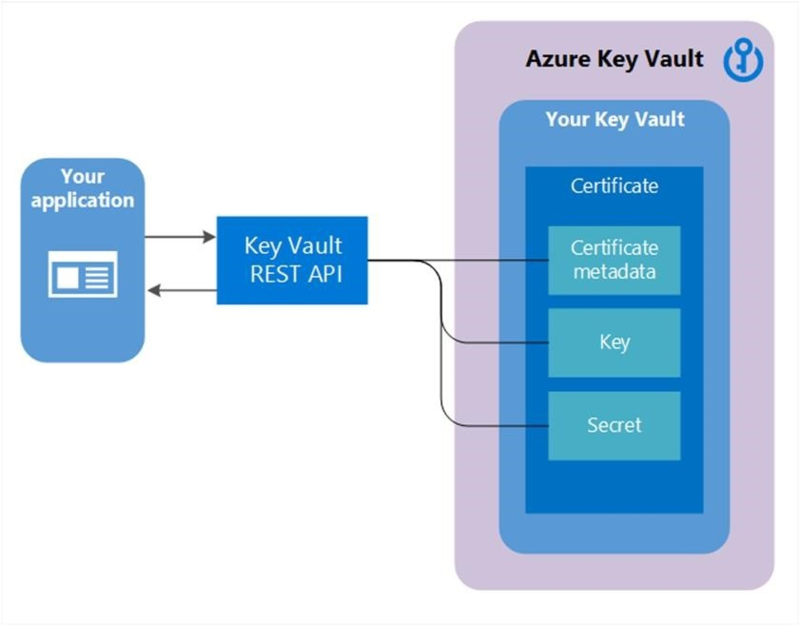 A certificate issuer is an entity represented in Azure Key Vault (KV) as a CertificateIssuer resource. It is used to provide information about the source of a KV certificate; issuer name, provider, credentials, and other administrative details. Credentials – CA account credentials. Each CA has its own specific data. For more information on creating accounts with CA Providers, see the related post on the Key Vault blog. Step 3.1 - Set up certificate contacts for notifications. This is the contact for the Key Vault user. Key Vault does not enforce this step. Note - This process, through step 3.1, is a onetime operation. Step 4 - The following descriptions correspond to the green numbered steps in the preceding diagram. (1) - In the diagram above, your application is creating a certificate which internally begins by creating a key in your key vault. (2) - Key Vault sends an SSL Certificate Request to the CA. (3) - Your application polls, in a loop and wait process, for your Key Vault for certificate completion. The certificate creation is complete when Key Vault receives the CA’s response with x509 certificate. (4) - The CA responds to Key Vault's SSL Certificate Request with an X509 SSL Certificate. (5) - Your new certificate creation completes with the merger of the X509 Certificate for the CA. A certificate creation process is usually an asynchronous process and involves polling your key vault for the state of the create certificate operation. Because of the delay to create, a cancel operation can be initiated. The cancel may or may not be effective. Alternatively – a cert can be imported into Key Vault – PFX or PEM. For more information on PEM format, see the certificates section of About keys, secrets, and certificates. Import certificate – requires a PEM or PFX to be on disk and have a private key. PEM / PFX files contains attributes that KV can parse and use to populate the certificate policy. If a certificate policy is already specified, KV will try to match data from PFX / PEM file. Once the import is final, subsequent operations will use the new policy (new versions). If there are no further operations, the first thing the Key Vault does is send an expiration notice. We currently don't support EC keys in PEM format. This method allows working with other CAs than Key Vault's partnered providers, meaning your organization can work with a CA of its choice. The following step descriptions correspond to the green lettered steps in the preceding diagram. (1) - In the diagram above, your application is creating a certificate, which internally begins by creating a key in your key vault. (2) - Key Vault returns to your application a Certificate Signing Request (CSR). (3) - Your application passes the CSR to your chosen CA. (4) - Your chosen CA responds with an X509 Certificate. 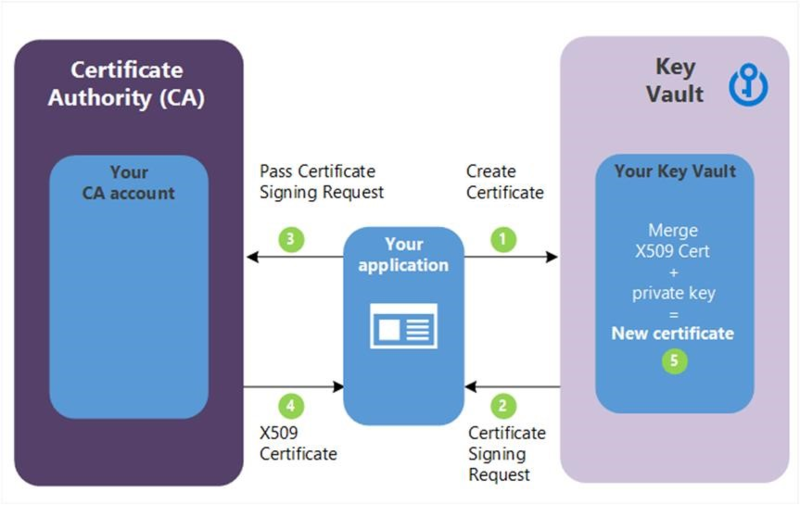 (5) - Your application completes the new certificate creation with a merger of the X509 Certificate from your CA.